With 1st XI/VI captain Simon Knott enforcing a zero tolerance policy on nights out pre-match synonymous with the Black Caps (but with greater success) our 3 squads arrived well rested and raring to play. After some initial difficulty with the pitch – nothing that duct tape couldn’t solve – our 3rd VI kicked off proceedings by batting first. Out strolled pair Nick Edmonds and Club Captain Miten Khatri – with the former facing, the latter keen to avoid a repeat of last years ‘diamond duck debacle.’ After a nicely timed stroke and well judged leave, Edmonds (1) managed to time the ball with pinpoint accuracy into the hands of the fielder at Gully. Edmonds will hope to have greater success at Pop! this week. A period of rebuilding ensued, with Khatri and Varsity veteran Robert Taylor working the ball off the walls nicely to get the score to a solid 21 off 3.3. Unfortunately, the fielder at Gully found himself in luck again, as Taylor’s (7) cut into the wall rebounded for a comfortable take. Finding the Coventry spinner difficult to play, 2nd XI captain Josh Thomas and Khatri continued with the steady progress before Thomas (4) was adjudged LBW to bring in President Luke Robinson, who with a nice shot for 1 took the total to 39-3 after 6. Tension amongst the home fans was building, and it soon skyrocketed as Khatri (10) found himself hitting a chest high full toss straight back to the bowler and 3 balls later the new batsmen Joe Birch (1) was stumped to take the total to 43-5 after 7 with the only hope of securing a total resting on Robinson as last man standing. With great diligence Robinson began to see off the good deliveries as easy as he sees off pints, and score big off the bad deliveries. He collected the first 3 boundaries of the day, one of which was the shot of the innings for 6 off the Coventry opening bowler as part of a lovely series of 3,3,6,3. Drawing mass approval from the support, Robinson (29*, 20b) carried the team to a total of 71 to give the bowlers something to bowl at. After a quick change over, Birch (0-28) opened up the innings and bowled a mixed bag, sharp unplayable deliveries were interspersed with wides, perhaps confusing the batsman, but also yielding 10 runs. Robinson (1-13), who bowled one of the spells of the day with a line tighter than the crammed balcony above, bowled a solid second over to leave the total at 16-0 off 2. Taylor (1-16) was brought into the attack, and was unfortunate to concede the first boundary of the innings which just eluded himself and the fielder on the back wall. Another unlucky over from Birch saw 9 runs conceded, none of which were off the bat. But there was soon to be some joy for the home crowd as Robinson’s accuracy clearly frustrated the Cov opener, who attempted to muscle a ball away but only succeeded in hitting the side wall for Edmonds to take a well judged catch, 40-1 off 5. An over of tight singles off Thomas (0-13) and Robinson’s last over preceded a phenomenal comeback a la Barcelona from Taylor which saw the No. 1 batsman out LBW and only 5 runs conceded to leave the innings balanced at 61-2 off 8. But with wickets in hand and the No. 3 batsman nicely settled, the Cov players eased to the required total with 4 balls to spare to repeat last years feat of winning the first match. A disappointing loss for the 3rd VI – compounded by the fact that 27 of the runs conceded were due to wides, but undoubtedly the 3rd VI will be back with a bang next year, fired up, but hopefully with some more control. However, with last year in mind, the 2nd VI began their game in the field to a mass of encouragement, confident that they could begin the charge towards history repeating itself. But with the first ball of the innings despatched confidently for 4 off of Nick Phillips (0-20) bowling, it was evident that it wouldn’t be an easy task. After a couple of solid overs displaying great swing and great accuracy from Dom Gill (0-31) and Rory Annandale (0-19), Phillips was unlucky to see the last ball of an over disappear for 6 to retire the opening batsman for 29, leave the total at 33-0, and spread a bout of tension amongst the crowds above to match the spreading of the field below. It was soon to turn into a rowdy Warwick crowd, as Annandale’s next over contained the first wicket to fall of the innings. P&C Danny Williams displaying an unbelievable combination of agility and accuracy to dive low, grab and throw in quick succession to run out the No.2 batsman for just 5 – rumour has it that tips from a certain CMD stretching coach have led to his increased lightness of foot. Brimming with confidence, a tight over from Williams (1-18) followed to take the total to 43-1 with 4 overs remaining. The new batsman clearly saw this as a trigger to attack, as despite Williams chalking up a ‘W’ with a sharp stumping by Siddharth off a wide, the runs began to flow quite freely as he found the gaps a lot easier than his A-level examinations. Another great piece of composure in the final over saw the No.5 run out by Gill, but Coventry manage to achieve a potentially challenging total of 88 off their allocation. Siddharth was joined at the crease by Tim Young, and caginess set in as the first 4 balls of the innings consisted of leaves outside the off stump. All doubts were eradicated shortly after as his 5th ball was punched for 6 with great poise. The next couple of overs saw Siddharth claim most of the strike and continue to work the ball away nicely, before again unleashing another straight drive for 6 to give the 2nd VI a strong start at 25-0 after 3 overs. The game seemed to be brought back into the balance next over, as Young (5) was caught out to bring in Williams. However, the D certainly was not silent as D. Williams fleetness of foot helped him in garnering 3s with remarkable regularity – allowing Siddharth (26*, 20b) to speed towards retirement – and with N. Phillips given time to settle, the total stood at 66-1 off just 7 overs with an over that conceded just 4 a brief respite for the Cov bowlers. As Williams (20*, 10b) and N. Phillips continued to work towards the total, it appeared that N. Phillips had taken the charge a little too literally – a couple of balls into the next over, the bowlers cluelessness regarding right of way led to a huge collision which sadly wasn’t replicated at the Rugby League match later in the day. Despite initially completing a run out (Dhoni in disguise?) after consultation between both teams and the umpires, the fair decision of dead ball was made as N. Phillips (24*, 14b) would have been comfortably home. Understandably shook up, and with a rapidly swelling face, the bowler continued with less zip and was punished by N. Phillips, accelerating UWMCC to a Sherlock Holmes victory – elementary – with 7 balls to spare. With the Varsity cricket poised perfectly with 1 game to play, Knott won a key toss to ensure that the 1st VI would be chasing. Varun Anand (0-10) opened up in tandem with Thomas Crick (1-27) and despite the former getting good turn and the latter renowned pace, the openers played them away fairly comfortably. However, miscommunication saw the opener run out by a great throw from Crick during Mark Phillips over, Coventry standing on 26-1 off of 3 overs. Soon the balcony was in raptures of whoops reminiscent of post-second recess of circles as Ashil Pindolia (2-27) came into the attack to bowl the over of the day, picking up 2 wickets in his first 3 balls as the batsman struggle to cope with the movement, one being clean bowled and the other playing on – momentum swinging rapidly in the favour of the UWMCC. However, the Cov No.3 looked comfortable, working the ball around elegantly, while his partner took a more Afridi-esque approach to take Coventry to 70-3 off 7 with their eyes on a big total. ‘It all comes down to this.’ The words on everyone’s lips as the deciding innings began, apart from our President, inspiring the team: ‘I won’t be able to enjoy drinking if we don’t win.’ Could lightning strike twice? Out to face the music was Charity Sec. Ben Marjot and Anand. A tetchy start filled with fantastic cricketing shots that weren’t getting full value and some good innovation left UWMCC on 14-0 after 2 overs, and left the crowd above astounded that the umpires were being paid for such a display of incompetence which left multiple no balls missed and a series of clear wides not given – a standard of officiating usually restricted to the Barclay’s Premier League. However, the openers continued on their merry way unfazed, with Varun dispatching the no-ball officianado for a couple of 4s in an over, before Marjot (25*, 13b) sprinted to his second consecutive Varsity retirement and sent the run rate flying along with the ball, taking the new bowler for 18 by sending the ball whence it came for a couple of 6s amongst a couple of 3s. Stress had begun to alleviate, confidence was spreading amongst the barmy army as the total stood at 47-0 after just 4 overs. ‘Varun will take a liking to this bowler’ commented Robinson – naturally 4 dot balls followed, in an over which conceded just 3 runs, but new batsman Knott was also off the mark. The run rate began to drop, as the new batsman settled, with the odd single taken to keep the scoreboard ticking, though the UWMCC were safe in the knowledge that there were plenty of wickets in hand. But then Anand (25*, 21b) was forced to retire at the end of the 7th over with the game hanging on a knife edge at 62-0 after 7, the pendulum swinging back to Cov as Crick (0) fell for a golden duck, stumped after a waltz down the wicket, and was soon followed into the pavilion (sports centre corridor) by Pindolia (0) who was stumped sharply 2 balls later. The incoming batsman M. Phillips worked well with Knott in rotating the strike and keeping the run rate in touch, scoring consistently with comfortable singles and taking the overthrows when they were given, but also sending tension to fever pitch as the total stood at 80-2 after 9, 14 required. You could hear a pin drop in the hall as Cov decided to send their opener to bowl the final over, evidently with the message to try and land his foot at least in the same county as the thick white line. With the serenity of an experienced opener, Knott calmly timed the first ball for a large 6 – cue mass chanting, who was in any doubt? 8 off 5 balls. A sharp run after a cover drive – 5 off 4 balls. Just as it seemed we would stroll home, a ball driven against the wall resulted in M. Phillips (11, 6b) run out, but having done his job. In came Marjot at the non-striker’s end needing 4 off 3 balls. A dot ball, 4 off 2? Sharp thinking from Knott clarified only 3 would be needed as getting to 93 whilst losing less wickets would be sufficient. Very next ball was timed nicely off the wall and a tight single was attempted…and made! The total had been achieved, fittingly by the captain Knott (25*, 16b) who showed some form where it matters – on the cricket pitch. 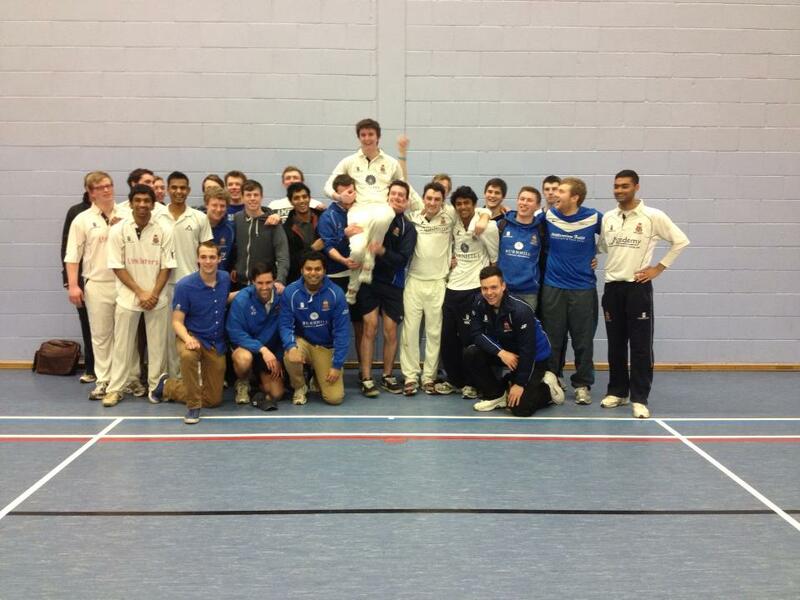 UWMCC were Cricket Varsity Champions for 2013! Socks were scattered about the balcony having been knocked off by a stunning performance by the UWMCC squad. Rumour has it that Coventry players need to come up with three reasons each as to how they would improve the teams performance or face expulsion from the team. The standard of cricket displayed bodes well for the outdoor season, and it is questionable whether the Coventry players crushed spirits will recover for next year, where the UWMCC will hope to make it three victories on the trot. A fantastic rendition of Everywhere We Go was a great end to a great day at Desso for the UWMCC. Congratulations has to go to every single member of the Varsity playing squads, and thanks to all of those present – all contributed to a memorable day of cricket.